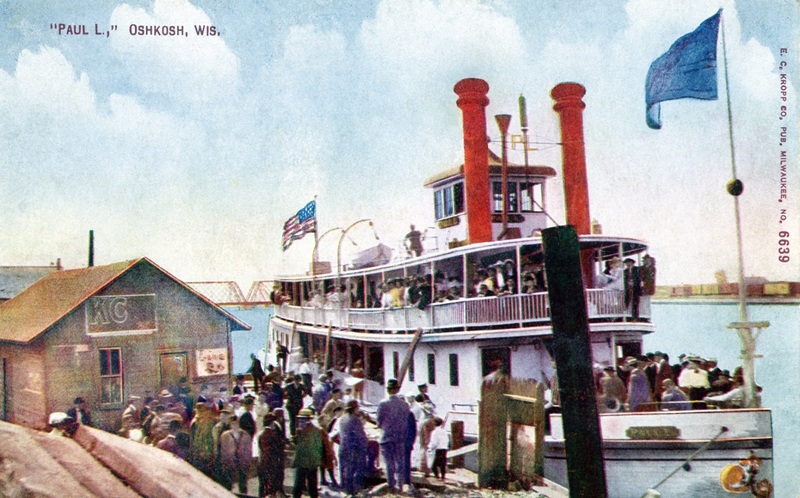 On May 28, 1910, she capsized at the dock in Oshkosh, where a load of coal that was being unloaded overbalanced the boat, caused a $300 loss in cargo. In 1922 she was made into a barge that sank at Appleton in 1923. 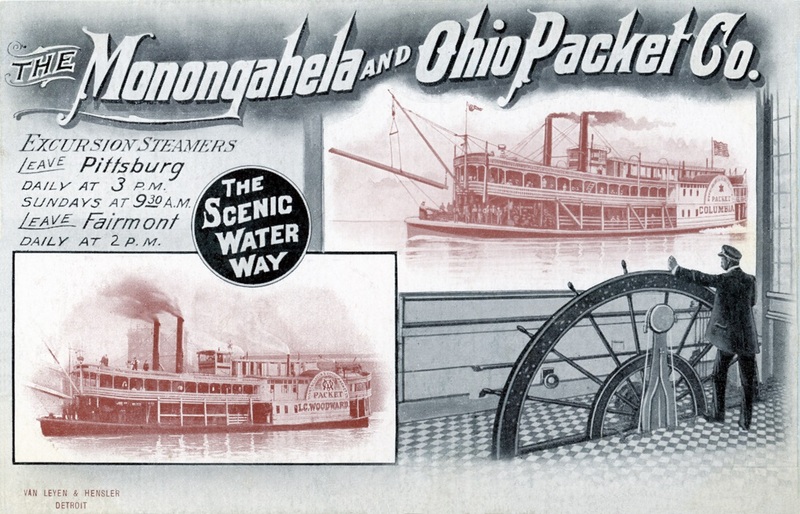 Monongahela and Ohio Packet Company, a West Virginia corporation, was organized in May, 1906. Capital stock authorized, $60,000; issued, $37,000. 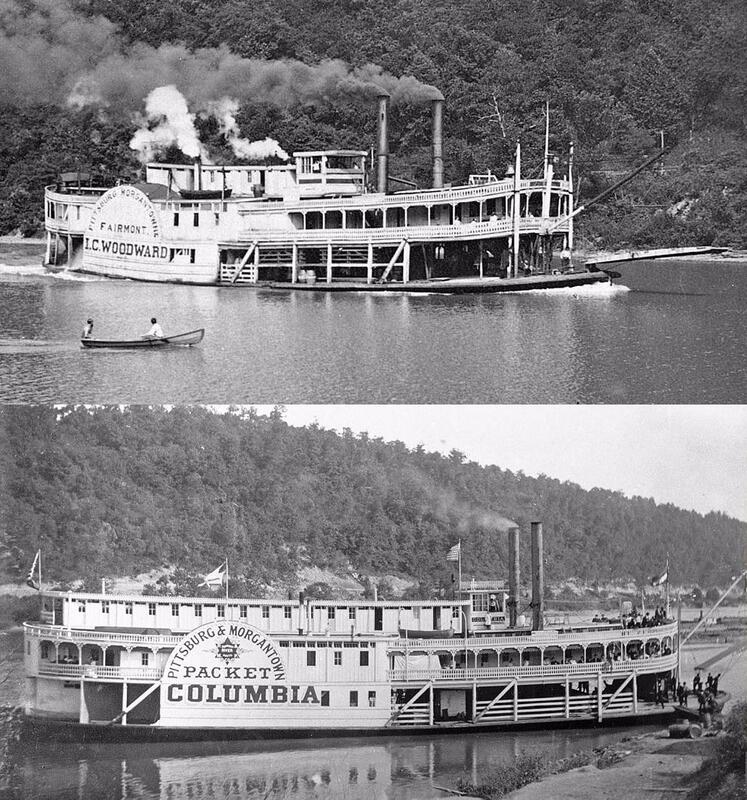 Operated a fleet of 3 steamers on the Monongahela River. Purchased the property of the Pittsburg and Morgantown Packet Company, and during 1906 operated from Pittsburg to Brownsville, Pa., and Morgantown, West Virginia. In 1907, on the removal of the old Baltimore and Ohio Railroad bridge below Fairmont, West Virginia, extended its line to the latter point. Traffic consisted of general merchandise. Built at West Brownsville, Pennsylvania at Axton Yard, 1898 for Pittsburgh, Brownsville and Geneva Packet Company, which consolidated July 1902 with the "Mason Line" to become the Pittsburgh, Brownsville and Morgantown Packet Company; named for Captain Isaac C. Woodward. Her texas was lengthened aft in November 1898. She ran Pittsburgh-Morgantown, twice weekly 1898-1911. 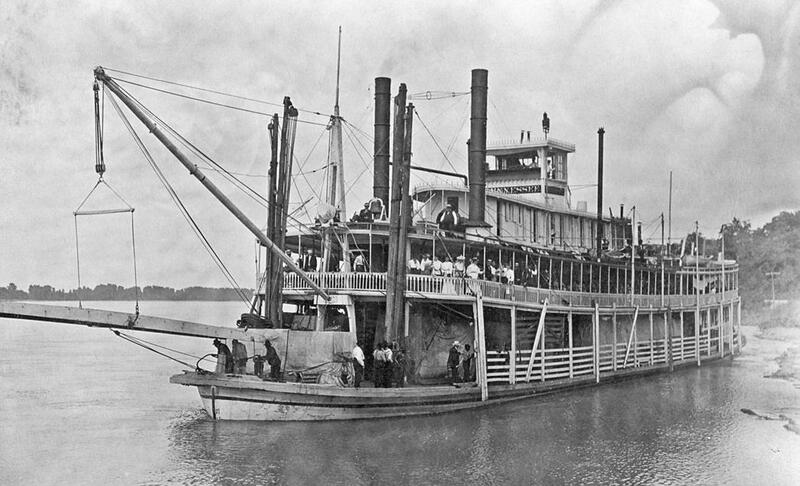 She ran one trip through to Fairmont, 1912, and ran excursions at Fairmont, October 1913; sold to New Albany, Indiana and converted into an excursion boat, renamed VIRGINIA. Built in 1902 at West Brownsville, Pennsylvania at the Axton yard for the Pittsburgh, Brownsville and Morgantown Packet Company with Captain John L. Reno (master, 1903) on the Monongahela River. She burned at Pittsburgh on Friday, January 16, 1903 at 3 p.m when a pot of roofing tar which was being heated aboard boiled over and set her afire. The Pittsburgh fire department responded and saved the hull. Built for the St. Louis and Tennessee River Packet Company; original price $8500; home port or owner's residence circa 1897 was St. Louis, Missouri. Under Captain Shep Green, she entered the Nashville-Evansville trade in opposition to the Ryman Line. She was in the boat parade from St. Louis to Memphis in 1907 when President Theodore Roosevelt went down the Mississippi River. 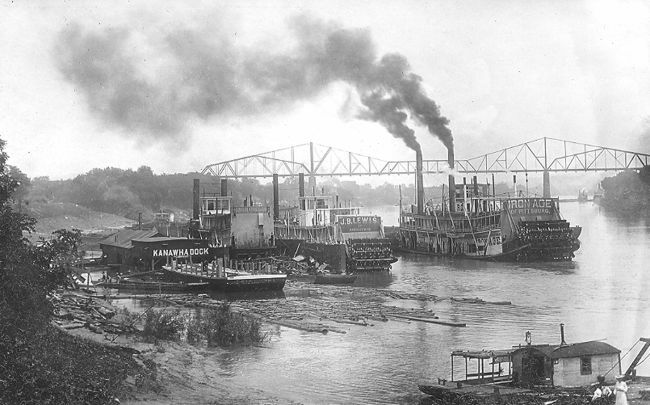 During a storm at St. Louis in July 1907, she hit a pier at Eads Bridge and was damaged considerably. 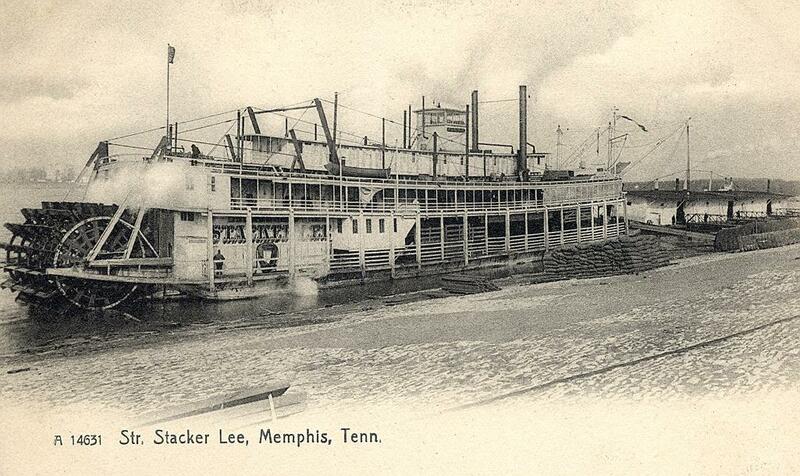 She was snagged at Little Blue Bend, Missouri and lost on September 11, 1908. 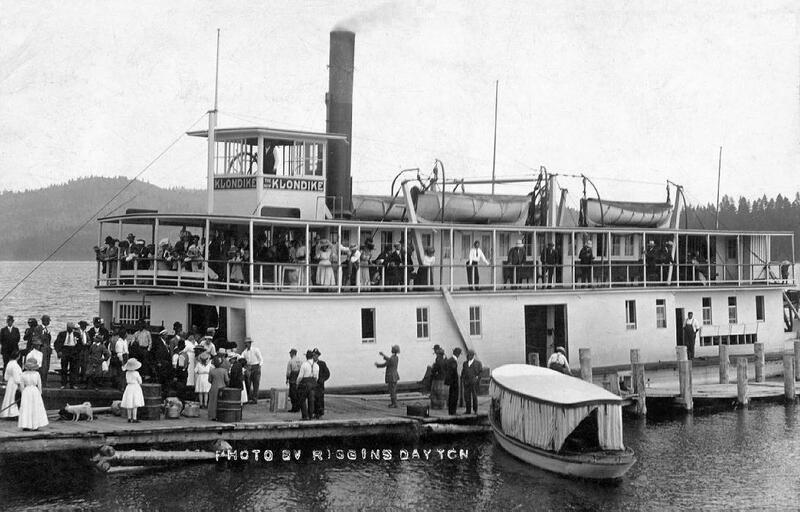 Attached is a real photo postcard of THE NEW KLONDIKE which ran on Flathead Lake in Montana in the early 1900's. Dayton is a little village on the west side of the lake and Riggins was the photographer. He may have taken the photo at the outset of an excursion and then printed the cards while the boat was gone so he could sell them to the passengers as they left. Nice tidy little boat, wish we could see more of the sternwheel. The ladies and little girls in white dresses and big hats make it interesting. There's a fellow on the dock talking to one or more passengers on the boiler deck above. A moment frozen in time . . .
"Chief Engineer on the Boat since built 4 years ago 1909"
So that was consistent with the boat's history. The cards had been glued in an album apparently and there's black paper from the album pages stuck to the back of both of them. The only fragments of writing that I was able to read were on the second card (the first apparently had nothing written on it). "Savannah, Illinois" on the top was the place it was evidently sent from and the words "yours, Dad" on the bottom signing off. Probably the 2 cards were mailed together in an envelope so they didn't have to be addressed or postage attached to them. 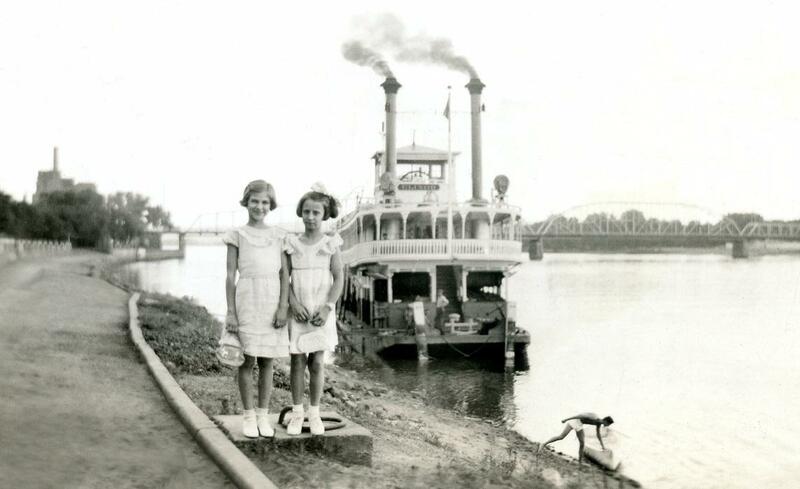 A charming snapshot just added to my collection with the towboat ELINOR in the background; two young girls are standing in the foreground and a young man on the shore bending over the bow of a skiff he's holding onto in the middle ground. The snapshot is dated 1935 and on the back it is stamped MOEN PHOTO SERVICE - LA CROSSE, WISCONSIN (on the Mississippi River where this photo was probably taken). Latest real photo postcard off eBay at an unusually reasonable price, what a treat for a change. It's the SUSIE, designed by the Howard boatyards and shipped up to the Klondike disassembled and built up there. 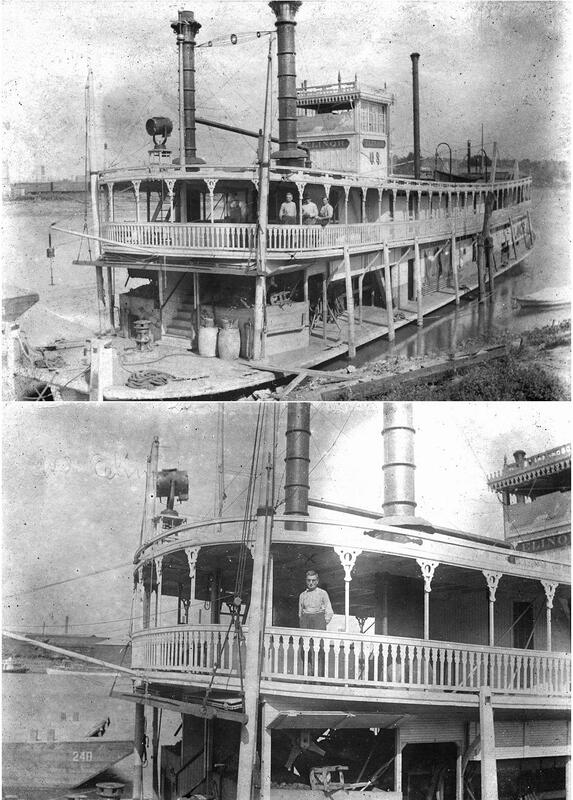 The SARAH and the HANNAH were Susie's sister ships (see citations from websites below), all 3 designed in the classic Western Rivers style to transport gold seekers during the Klondike Gold Rush. 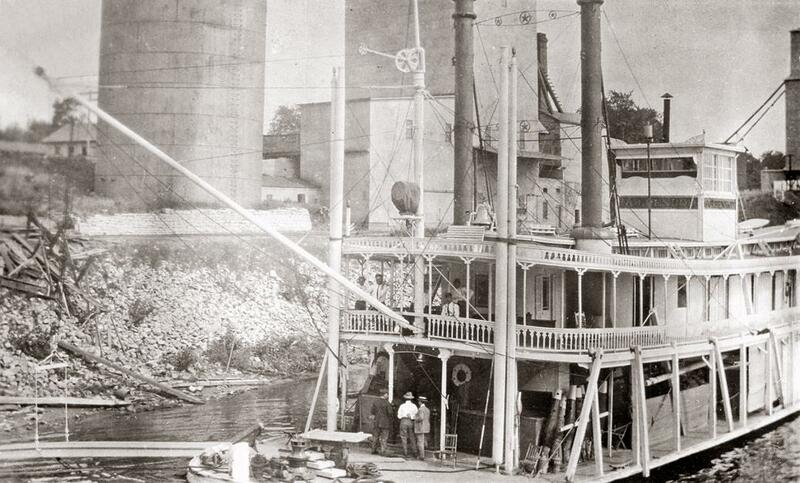 Iowa steamboat captain W.H. Bledsoe went up there and was sued for "breach of promise" . . . sounds like he "jilted" some lady he proposed to. I don't think they're doing much of that any more. 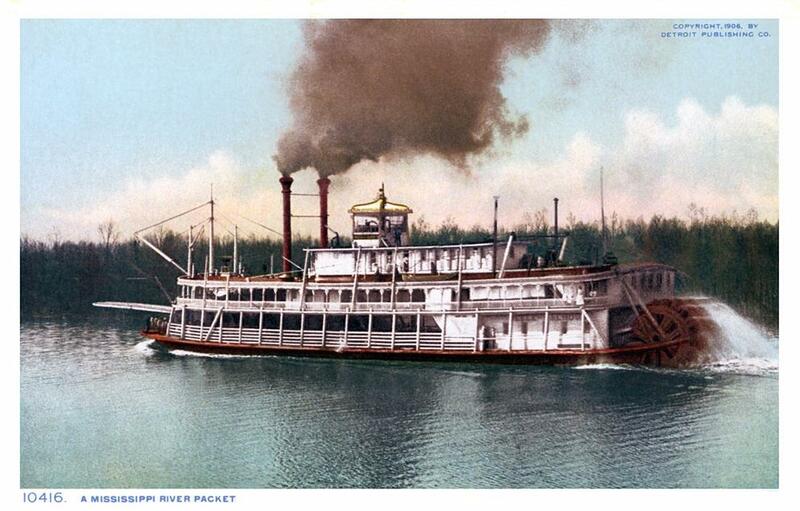 The Sarah, Susie, and Hannah were the queens of the Yukon River steamboats. Ordered by the Alaska Commercial Company, they were built in Indiana and shipped to Unalaska where they were reassembled. 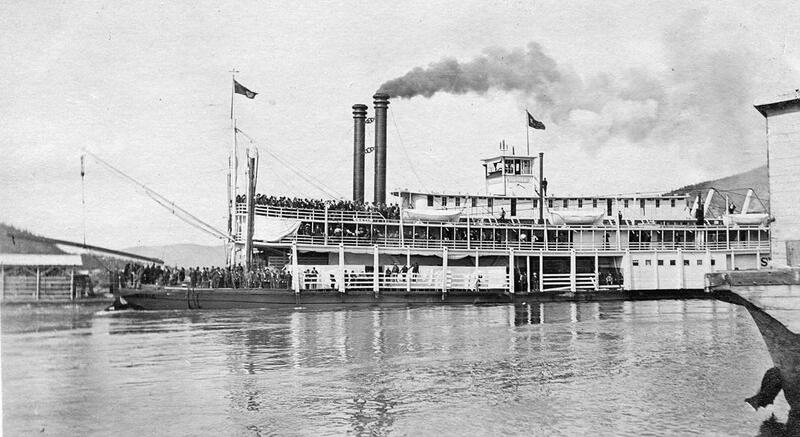 The 222-foot sternwheelers had 1,000-horsepower engines. They served with style, from rich mahogany-paneled dining rooms to their monogrammed bed linens. The boats were designed to carry 150 passengers, but sometimes as many as 500 persons were aboard. 1877, Born, Iowa (Federal Census, 1920, Iowa). 1900, Captain Bledsoe was from Davenport, Iowa. In 1900 he was pilot on the SUSIE with Captain Dolson (Waterways Journal, May 12, 1900, p 10). 1901, The Davenport Republican for Aug.11, 1901 has an interesting article regarding his being sued for breach of promise regarding his time in the Klondike. This is an undated photo postcard that I won in an eBay auction. On the back is penciled "From Mary Vanpattan (to) Miss Irma Carpenter Sandford, Ind." Above these girls dressed in men's clothing Mary wrote their names in pencil. Mary herself is on the right and the one in the middle is Ethel Hay. The name of the one on the left is more difficult. There's an indecipherable squiggle in front of what seems to be the last name "Broeff" This was advertised as being 3 "boys" on eBay, the seller didn't look very closely. The first thing I noticed was the high heeled shoes, then the rolled up trouser legs and outsized coats. Very cute old picture taken aboard a house boat or "shanty" boat. Must date from the early 1900's. Know this isn't steamboaty although that must be a barge right alongside there. Won this postcard on eBay. The highest I ever paid for one during bidding war, don't even want to remember how much it cost. Great picture of 3 boats at the Kanawha Dock, West Virginia. GEO. MATHESON, J.B. LEWIS and IRON AGE. Nice houseboat in lower right too. This is the best of a set of three vintage photo postcard/snap shots of this mishap that I bought some years ago. 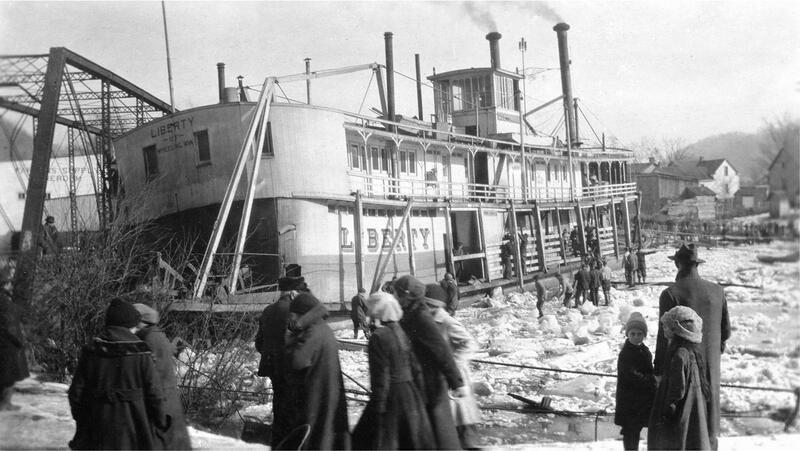 In the margin under the photo is written: "Feb-6th 1918"
"Str Liberty caught in ice against (old) bridge across Sunfish Creek. Boat had been put in creek for safety from flood waters." Excellent real photo postcard of a boat which Fred Way said was "an attractive example of marine architecture." High praise indeed. Built Jeffersonville, Indiana., at the Sweeney Yard, 1888. 150 x 26.5 x 3.7. Engines, 12's- 5 ft.
Two boilers. An attractive example of marine architecture. Served the government lights on Ohio River and tributaries replacing the LILY. Capt. Owen F. Jolly was master in early years, then Capt. Leslie T. Hill, native of Aberdeen, Ohio was on her until the end. Harry Layfield, New Richmond, Ohio, went aboard as a striker engineer 1903, became chief 1912 and left her in 1917. William Handley was engineer for 22 years. Decommissioned when the GREENBRIER was built in 1925, and sold to John Lyons, Middleport, Ohio. He moored her under the ice piers there, and in a flood she broke away and was lost. To see photos of the Greenbrier, go to davet-photos15.